This is the perfect summer salad and a great accompaniment to the grilled sardines. 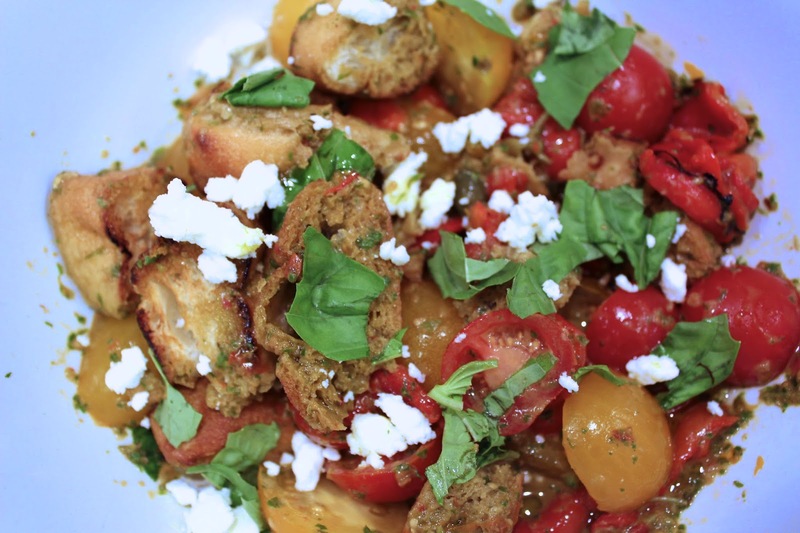 Panzanella is a Tuscan salad made with crusty bread and tomatoes. 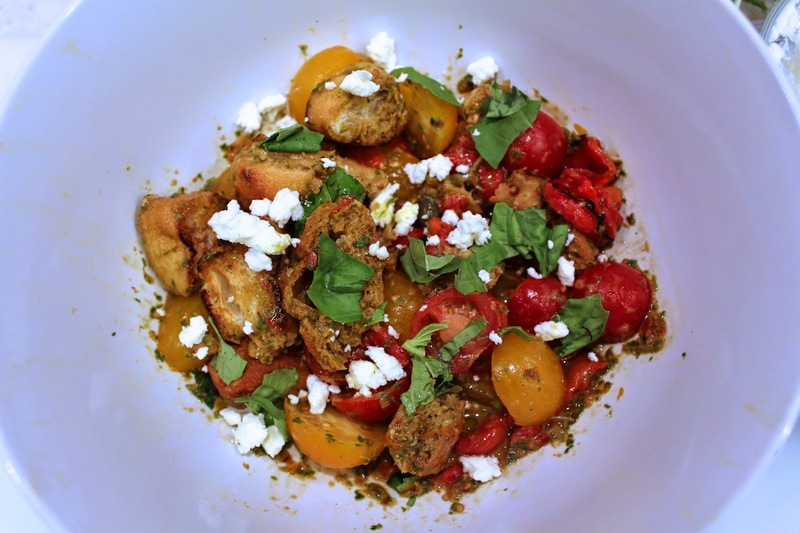 The addition of feta and roasted red peppers gives it a Mediterranean flair. The original recipe called for anchovies in the dressing, but I didn't have any on hand so I just added a tiny bit of sea salt. The dressing came out perfect. I really liked this salad because it was super easy to make and very delicious. The sweet cherry tomatoes went well with the fragrant basil/balsamic dressing, and the creamy tangy feta was a boost of flavour. The only thing I didn't like was how the toasted ciabatta absorbed the sauce quickly and became soggy. When I make this salad again, I will be sure to add the ciabatta last. Enjoy! 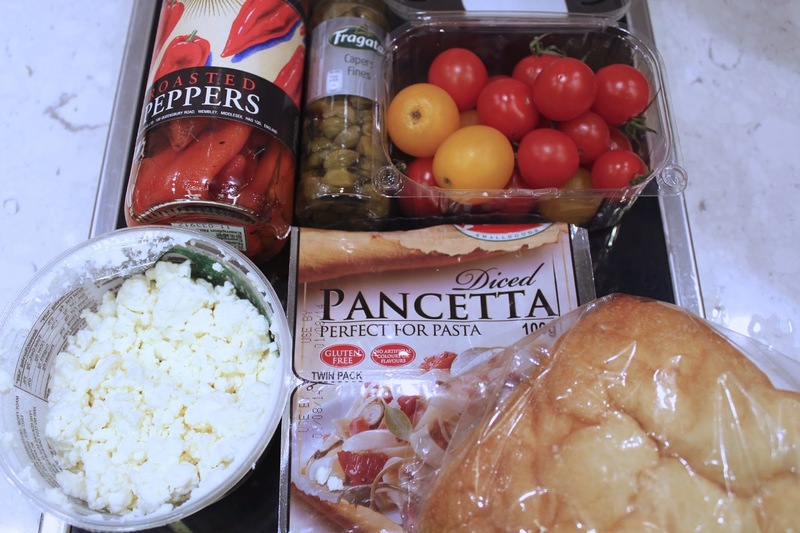 Oops the pancetta was for the sardines, but here are the main components for this salad: feta, roasted red peppers, capers, cherry tomatoes and ciabatta. Blend together a clove of garlic, extra virgin olive oil, balsamic vinegar, spring onion, basil and 3-4 cherry tomatoes. The original recipe used 1 cup of cherry tomatoes, but it was such a waste of the beautiful tomatoes, so I used only 3. It was enough to create a dressing-like consistency. I followed the original recipe and added the toasted ciabatta before the tomatoes. The bread absorbed a lot of the sauce and became soggy real fast. I have altered the recipe below to reflect this. Cut the ciabatta into 1 inch thick slices and toast them on both sides on a pan. Peel the garlic and put into a blender or food processor with 1 tablespoon olive oil, balsamic, 3-4 cherry tomatoes, spring onions and basil. Blend until it becomes smooth. Pour into a large serving bowl. Halve the remaining tomatoes and add to the bowl, along with the capers and peppers. Toss. 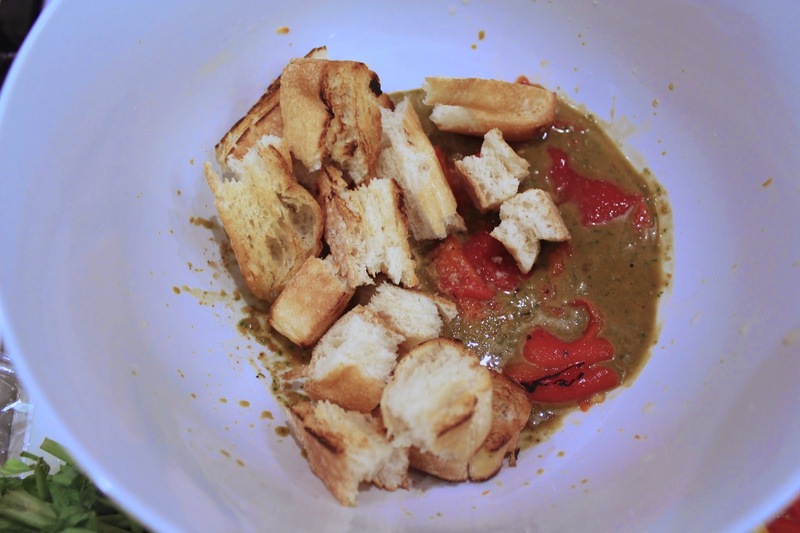 Tear the toasted ciabatta into thumb-sized pieces into the bowl and toss once only to coat. Drizzle 1 teaspoon of olive oil to finish. Garnish with torn basil leaves and feta. Serve immediately with the grilled sardines.